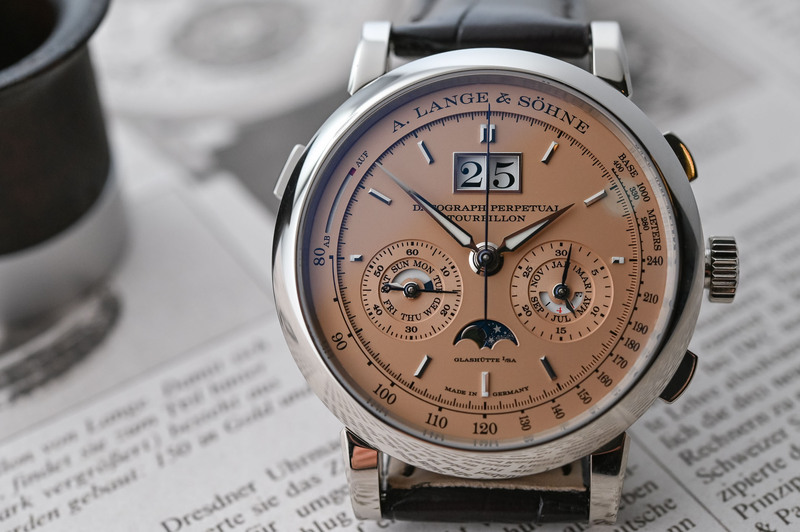 The trend for salmon dials as expressed by A. Lange & Söhne... in a high-end way, of course! 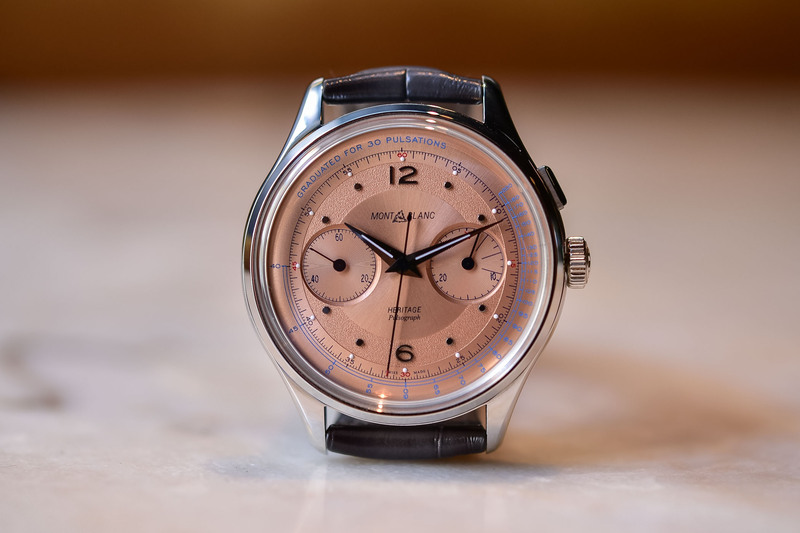 Montblanc, Audemars, Patek and more… Salmon/pink dials are THE trend for the 2018/2019 collection. Even though not entirely novel, we’ve never encountered so many watches with pink-coloured dials as we have this year. Don’t get us wrong, we actually love salmon dials here, at MONOCHROME (see Frank’s love letter here). There are, however, different ways to execute a salmon dial and when it decided to do its first real pink-coloured timepiece, A. Lange & Söhne took the high-end road… really high-end, with the new Datograph Perpetual Tourbillon and its solid pink gold dial. 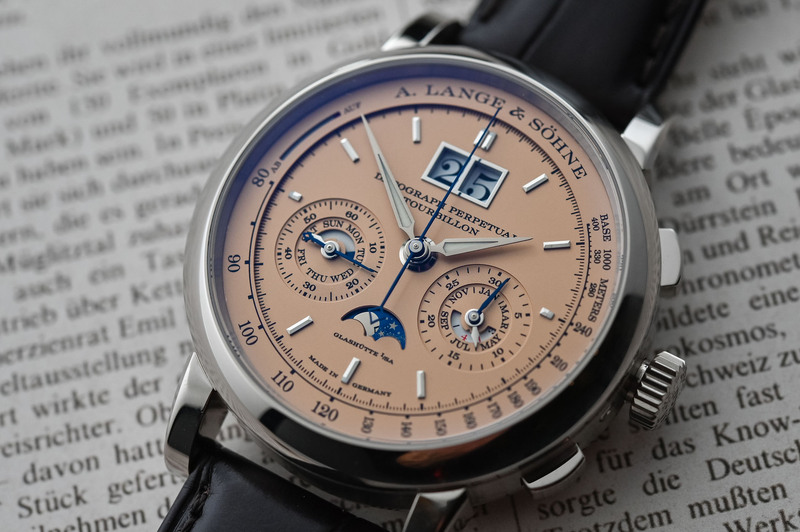 After a rolling series of blue dials (from 2013 to 2016), after multiple bronze watches (a trend that isn’t over, as seen at the SIHH with multiple bronze case/green dial watches), the major trend for high-end watches this year seems to be the combination of white metal and a pink/salmon dial. 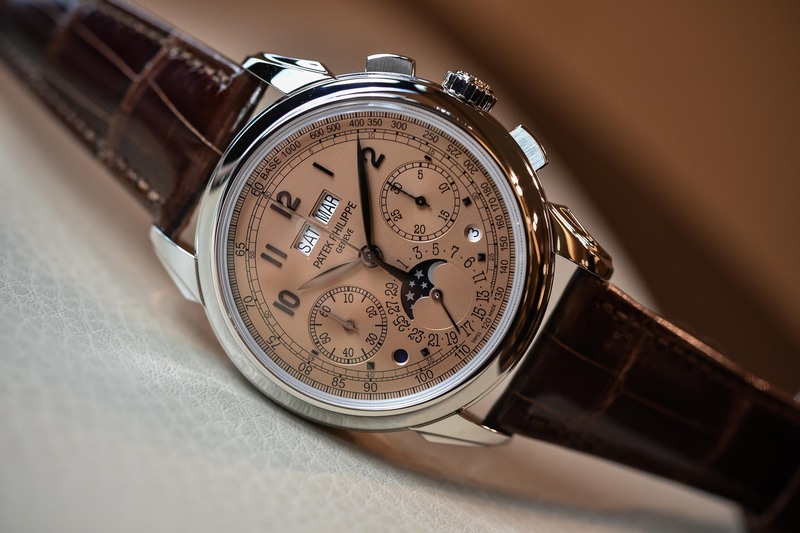 Such a combination isn’t new, as it has been used in the past by many watch brands – but it has always been a sort niche trend, not something that brands truly believed in. The situation is apparently changing and pink-coloured watches are cropping up everywhere (and Baselworld might bring even more). Making a black or a silver dial is (normally) relatively easy. Blue is a colour that is a bit trickier but, then again, knowing the hundreds of shades available, there’s often one blue tone that can fit the watch. Salmon is, however, much more difficult. Salmon isn’t, like blue or green, a generic word for dozens of tones. It is one narrow definition. And because of that, it needs subtlety. 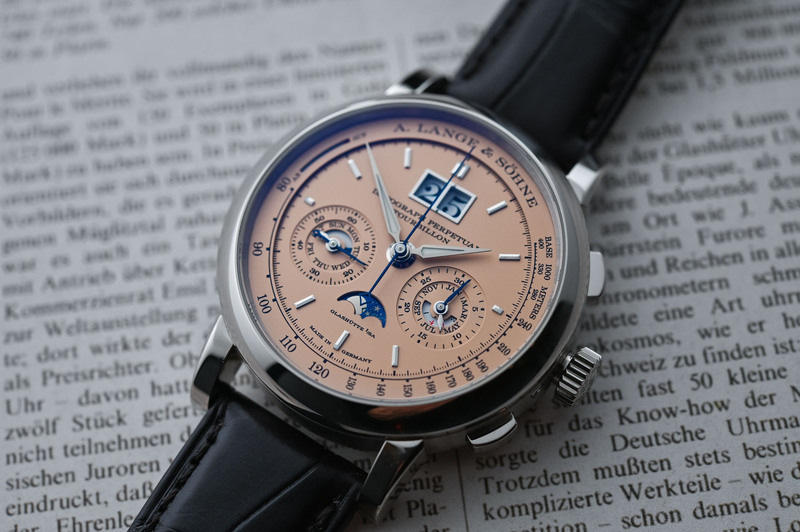 We’ve seen watches too pink, too saturated, too gold-coloured… So in order to avoid such problems, A. Lange & Söhne took another path and crafted its first watch officially commercialised with a salmon/pink dial (there have been a few unique pieces before, but nothing official) with a solid, untreated, uncoated pink gold dial. 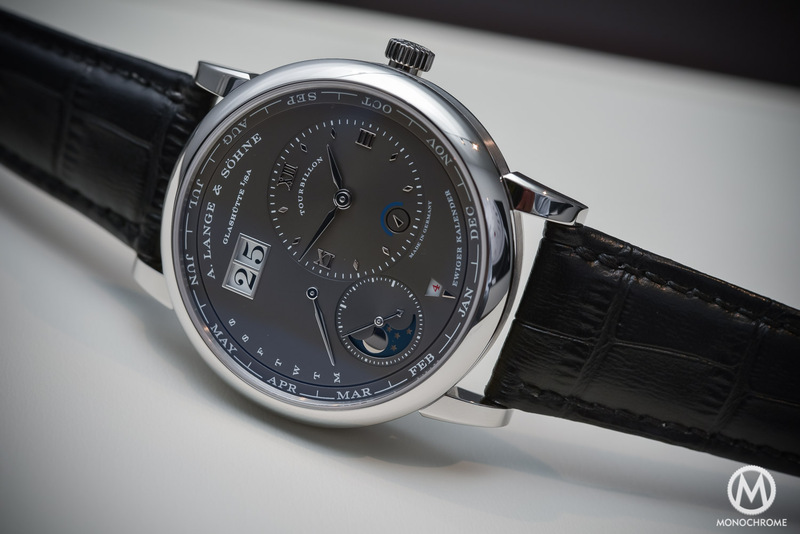 The dial of the new A. Lange & Söhne Datograph Perpetual tourbillon isn’t painted or lacquered. It is made of solid gold, machined directly from the material. The colour results from the colour of gold itself, as it is untreated and uncoated. Pink gold as it is, period! 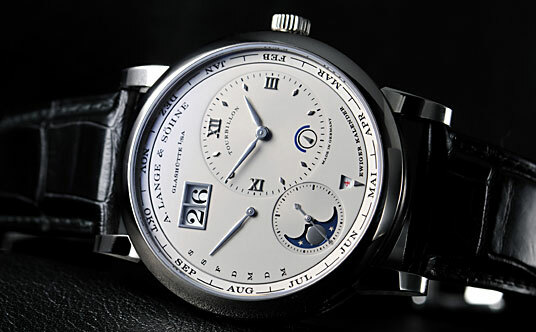 Dials are a great part of the beauty of an A. Lange & Söhne watch. Usually galvanized, sometimes enamelled, the brand isn’t fond of using “entry-level” techniques. Thus, when it decided to enter the race for the nicest salmon (is it salmon? ), the Saxon brand took no shortcuts. Why even search for a specific colour when a solid material already offers a superb tone? Hence the choice for a solid, untreated and uncoated pink gold dial, here with a finely grained (matte) finishing. The result is extremely hard to catch on photos. 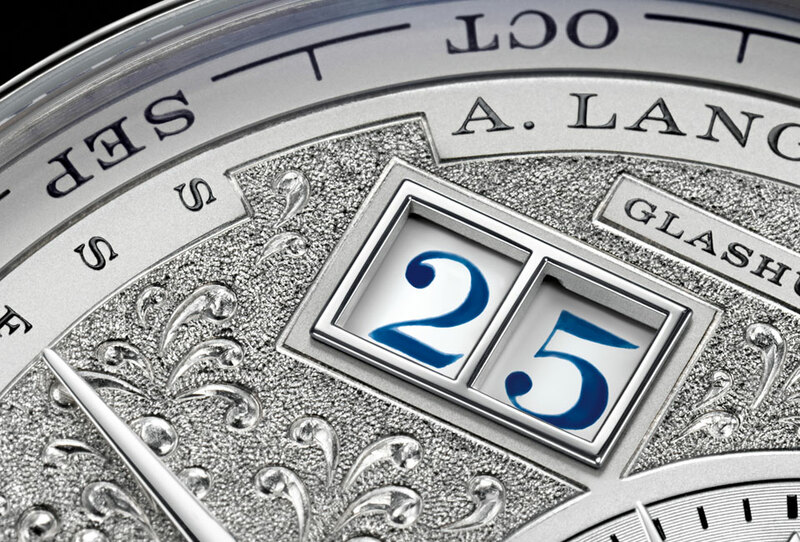 Even the official photos, as seen here, don’t do credit to the beauty of this dial. The pink gold dial of the Datograph Perpetual Tourbillon has a delicate, discreet and slightly metallic colour. Compared to the photos of the other watches illustrating this article, the difference appears to be minimal, but in the metal, the choice for a solid gold dial makes a true difference. Quite fascinating indeed. Compared to the model introduced in 2016 – another 100-piece limited edition, with a black dial – the watch has a completely different feel. More aerial, less contrasted, but visually lighter. The inaugural version with a black dial certainly created the link with the classic Datograph but this pink gold dial edition is the winner of the show for us. And let’s not forget the subtle blue accents (hands and moon), a colour that always perfectly matches with pink/salmon – especially when used sparingly. 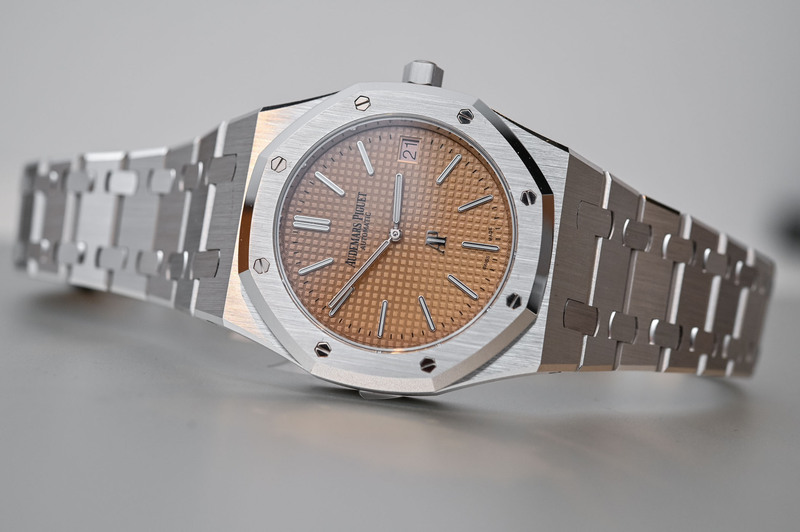 All in all, this new model might just have a different dial, but it creates a totally different perception. Partially hidden complexity might be one way of describing the mechanics powering the Datograph Perpetual Tourbillon. 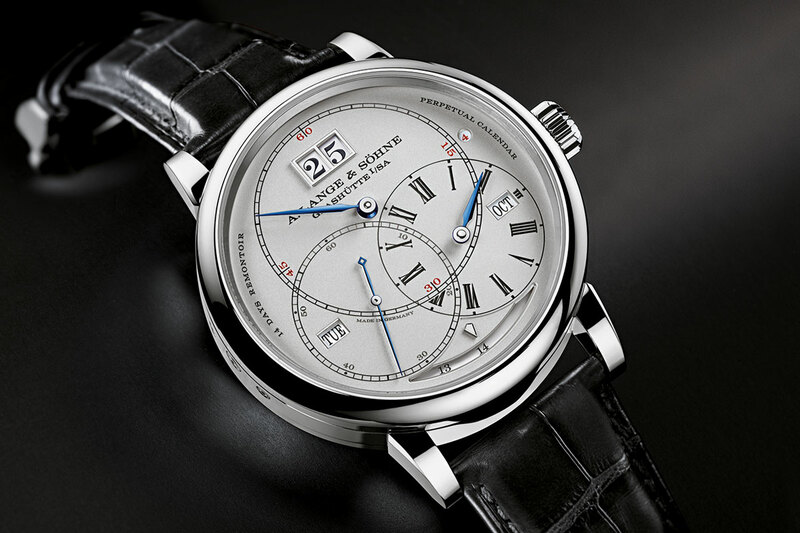 This watch is part of A. Lange & Söhne’s über-complications, alongside, for instance, the 1815 Rattrapante Perpetual Calendar, the Tourbograph Perpetual Pour le Mérite and, of course, the Grande Complication. The Datograph Perpetual Tourbillon is the final link in a chain of chronograph watches based on the iconic Datograph Up/Down. Then comes the Datograph Perpetual and finally the present watch, with the addition of a tourbillon regulator. 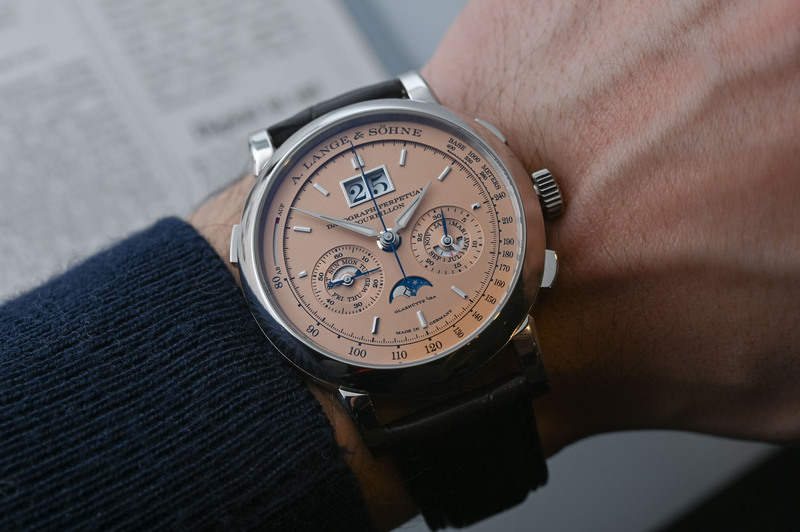 Everything starts from the base of the Datograph Up/Down, on top of which a perpetual calendar module has been added – rather well integrated, in fact, as apart from the moon phase indicator, no sub-dial has been added to the dial. Of course, the Oversized Date, a signature element of the Datograph, has been maintained at 12 o’clock. Then, the brand decided to focus on precision and to add an anti-gravity regulating organ – a tourbillon. However, with its usual focus on legibility and balance of the indications, it was hard for the brand to add such a device on the dial side of the Datograph – which, in addition to that, would have been difficult knowing the low position of the sub-counters, leaving little space on the dial for an aperture. The choice was to leave the tourbillon hidden on the reverse side of the watch – something that we clearly appreciate, making this watch a sort of egoistic pleasure and keeping it “relatively” low key. 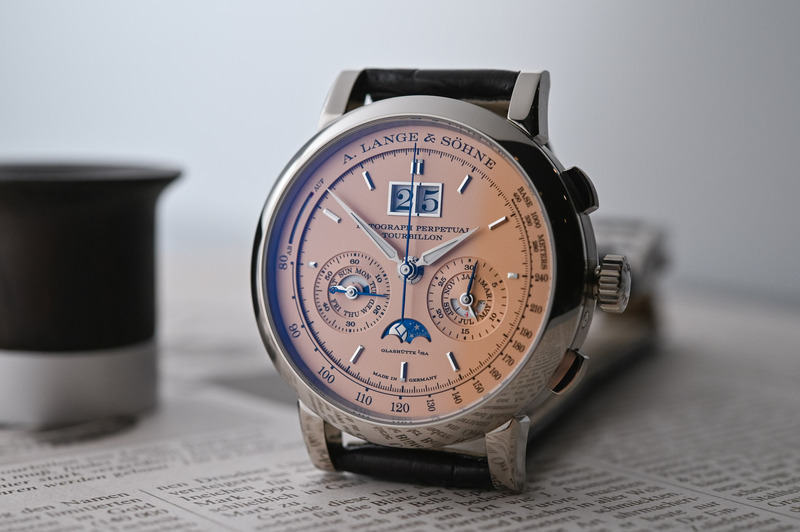 The movement of this new A. Lange & Söhne Datograph Perpetual Tourbillon with Pink Gold dial is exactly the same as the one used in the inaugural black dial edition. 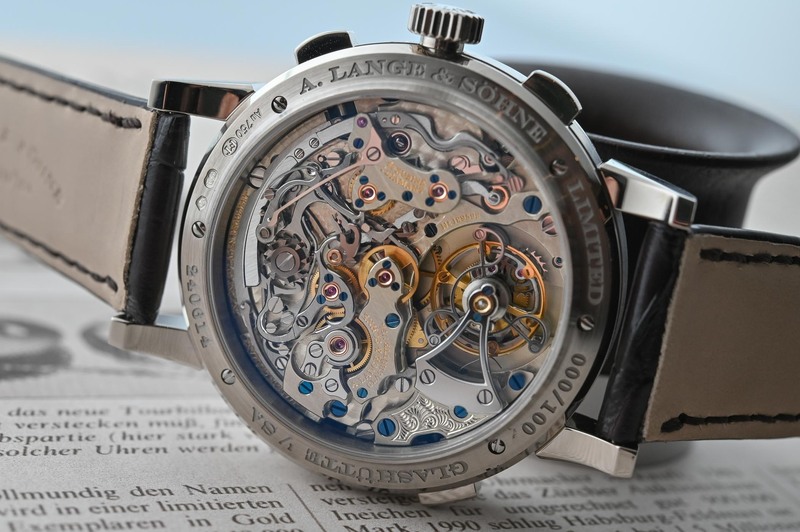 The base is the chronograph movement of the Datograph (column-wheel, horizontal clutch) on which a QP module is added and with a regulating organ that has been replaced. The view through the caseback is simply mesmerizing, with an impression of depth and opulence that only Lange can achieve. Decoration and finishing are, as expected, impressive. For more details about the watch, its movement and its complications, check our previous article here. For this new limited edition of 100 pieces, the brand keeps the same case, measuring a rather compact 41.5mm x 14.6mm – not per se a small watch but still decent knowing what ticks inside – but now made of 18k white gold instead of platinum previously. The choice for white gold is relevant with the dial, as being slightly warmer than platinum and thus better matching with the dial. The watch is worn on an alligator strap – here in black, a nicer combination than the brown strap seen on the official photos. 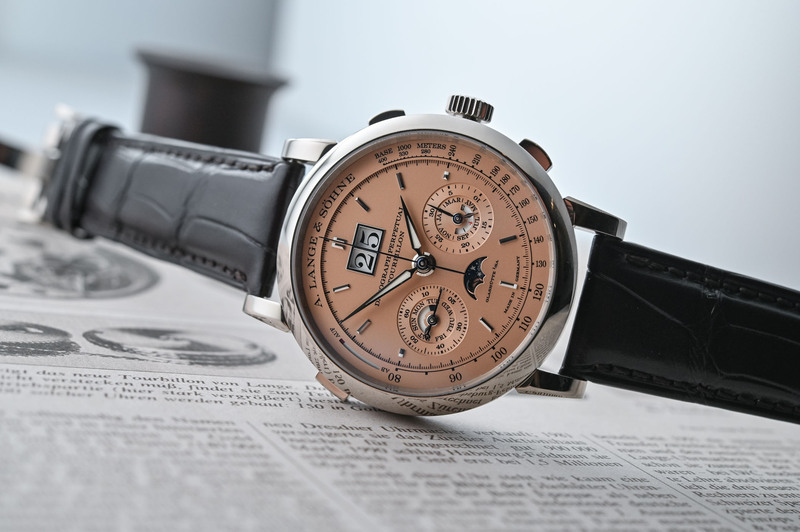 This new Pink Gold dial version of the A. Lange & Söhne Datograph Perpetual Tourbillon (ref. 740.056) will be available as of May 2019 and priced at EUR 285,000. 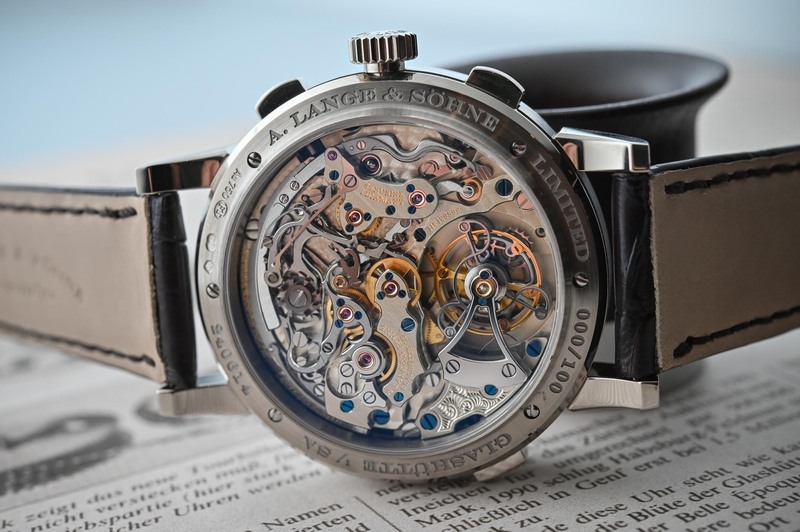 More details on www.alange-soehne.com. More peach than pink. And what a peach. Whenever I see a Lange (practically any Lange), I pray that Grand Seiko will finally swallow its pride and take a leaf out of their design book. They always manage to be precise without being sterile. I do not like this plethora of pink we are seeing recently. It just looks awful, especially pink gold cases. I also think they will look very dated very soon. 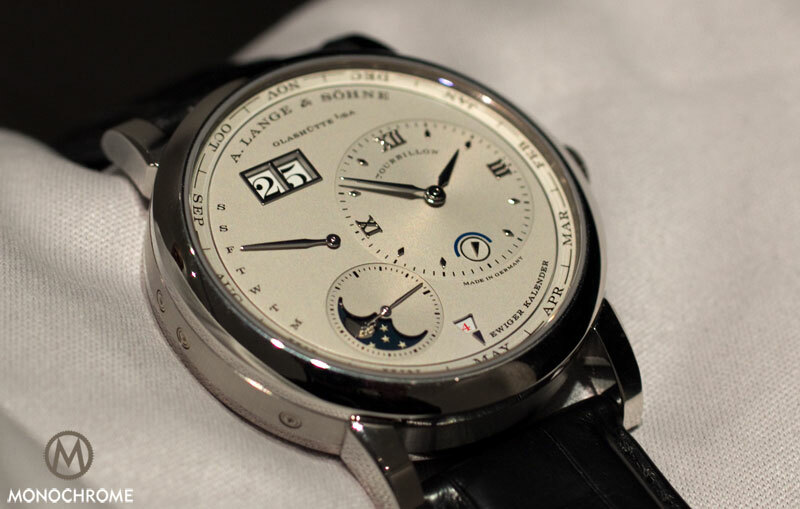 But this Lange might just be the exception which proves where everyone else went wrong.